With an active role in development, relief and advocacy, the Church of Bangladesh is on the frontline in mission and is reaching out to serve its communities. 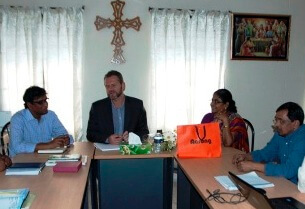 In a meeting with the Synod officials of the Church of Bangladesh, Revd Andrew reviewed the Alliance programmes that the Church is taking forward, and addressed top priorities for the future of the Church’s work. 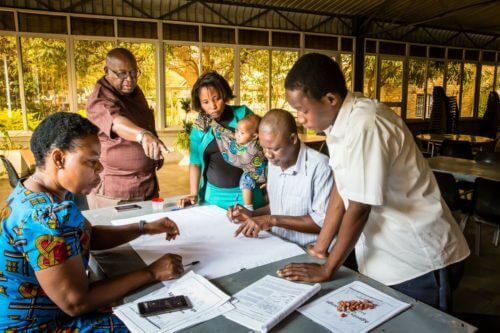 Poverty reduction, capacity building and advocacy for the rights of the poor are priority areas for the Church and they are looking forward to working with the Alliance to strengthen these areas and effectively serve their community’s most pressing needs. Revd Andrew also had the opportunity to see some of the Alliance programmes that are currently being taken forward by the Church. This included three Agents of Change student groups, two of which will launch in the New Year, and the Commonwealth Foundation project, which is working for the economic empowerment of women and young people in the coastal regions through advocacy and participatory governance. One of the women leaders in education for the Alliance’s Commonwealth Professional Fellowship Scheme will also come from Bangladesh. Janet Sarker is the Education Coordinator for the Church of Bangladesh and will visit the UK for seven weeks next year. She will take part in placements and training for the development of her role, and will take back what she has learnt to progress education in her home country. Education, health, young people and children’s development were among the top themes presented by the Church of Bangladesh, and theology and evangelism were also shared as part of the Church’s mission. The persecution of Christians in the region was noted as a particular challenge, and is one of the main constraints on development in the country. Revd Andrew was inspired by the work of the Church and their dedication to the eradication of poverty and injustice. And the Church of Bangladesh showed their appreciation and gratitude for his visit, and for the Alliance programmes that have brought such support and encouragement to their work. The Church particularly noted the results of the campaign for the garment workers of Bangladesh, which was initated by the Anglican Alliance in partnership with a global coalition of churches earlier this year. The Alliance will continue to support the Church of Bangladesh and work together for the eradication of poverty and injustice and to advocate for the needs of those most oppressed.